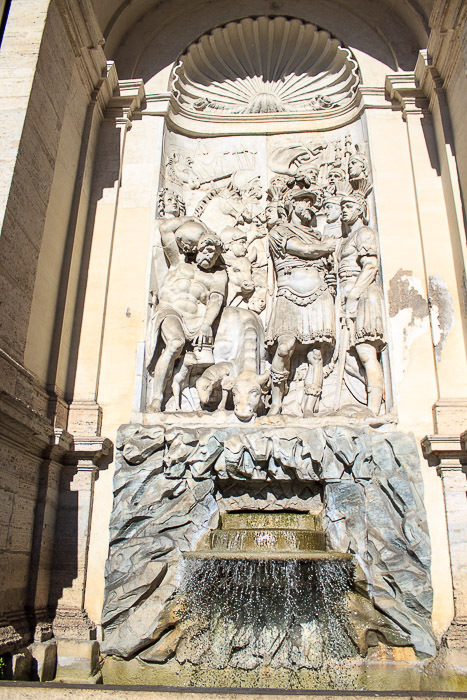 The Moses Fountain (1st photo below), designed by Domenico Fontana in 1587, is also known as the Fontana dell'Acqua Felice because it is fed by the Aqua Felice aqueduct which was built in 1586. 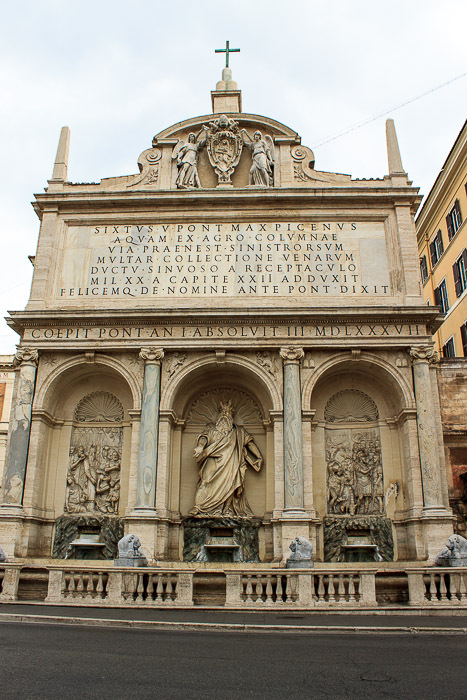 It is a monumental fountain which has three equal arches on the bottom level with a huge flat inscription above and a papal coat of arms at the top. Inside the arches are depictions of the Exodus of the Jews from Egypt. 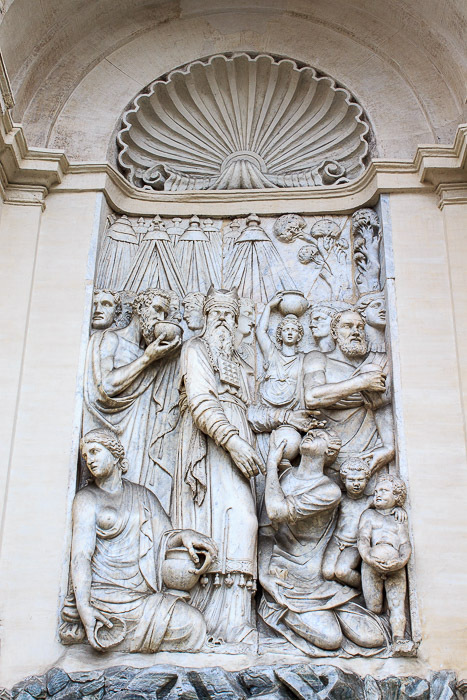 The left arch shows Aaron leading the gathering of manna to provide food for the Jews during their journey (2nd photo below), the central arch has a large statue of Moses (3rd photo below) with a severe facial expression making water spring from the rock, sculpted by Leonardo Sormani and Prospero Antichi, and the right arch shows Joshua selecting the soldiers for the battle of Rephidim against the Amalekites (4th photo below). Beneath each of these is a fountain spewing water into large pools at the base of the fountain. 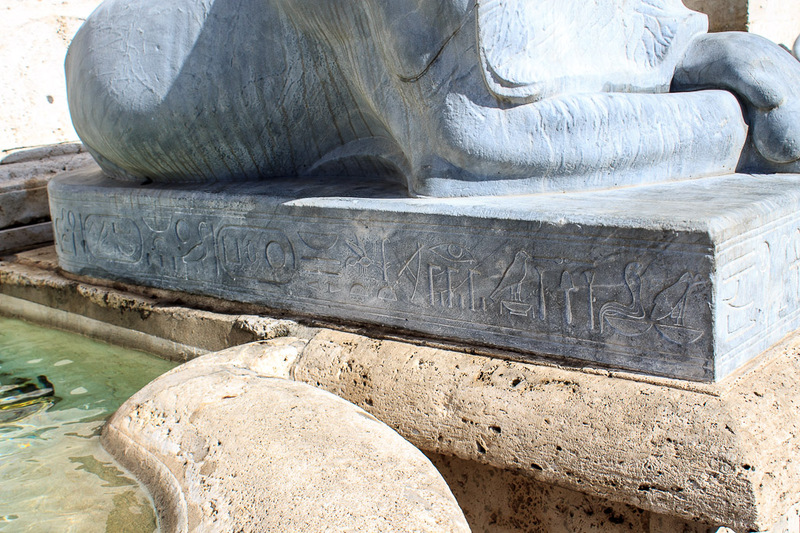 See all Moses Fountain photos. 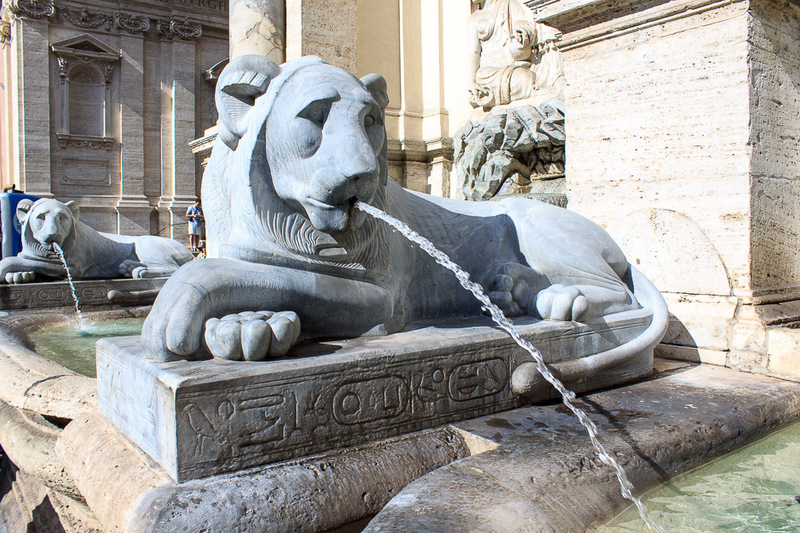 Surrounding each arch are columns, below which are Egyptian lions with hieroglypics on their bases, spewing more water from their mouths (5 photos below). Even in the 17th century this fountain was considered as being in very bad style, with the sculptures being called mediocre and the disproportionately large attic being simply a huge flat billboard for the inscription. 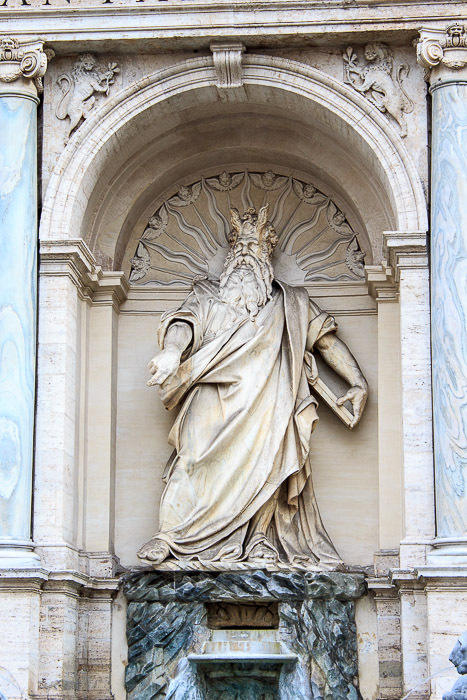 When compared with Michelangelo's Moses in the church of St. Peter in Chains, the Moses on the fountain is out of proportion and doesn't correct for the position of the viewer. It is also out of time-synchronization with the rest of the sculptures, since at the time when Aaron brought water to the wandering Hebrews, Moses did not yet have possession of the tablets of the Ten Commandments. 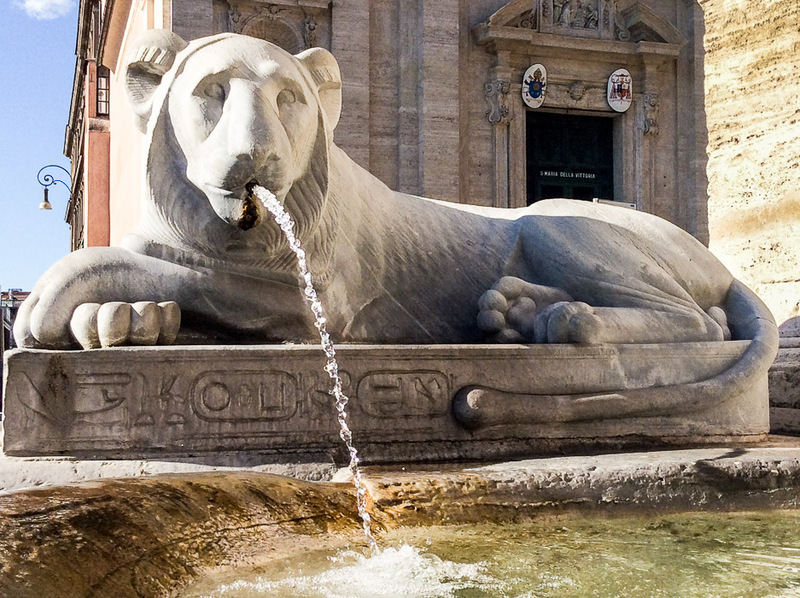 Nevertheless, the Moses Fountain inspired the Big Fountain, created about 25 years later. 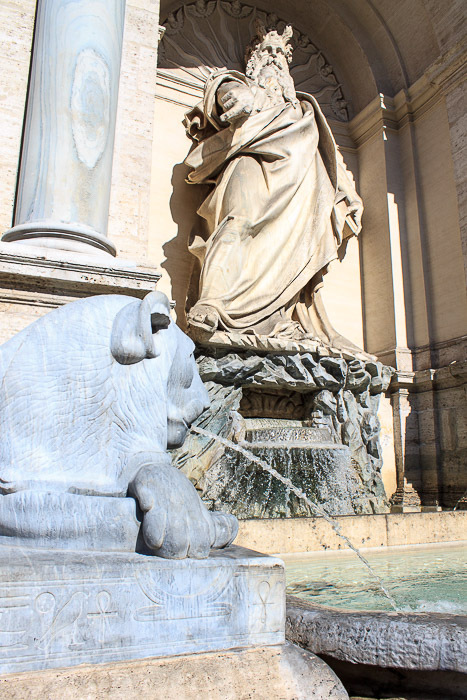 Just across the street from the fountain is the spectacular church of Santa Maria della Vittoria (the doorway is in the background of the 5th photo below).